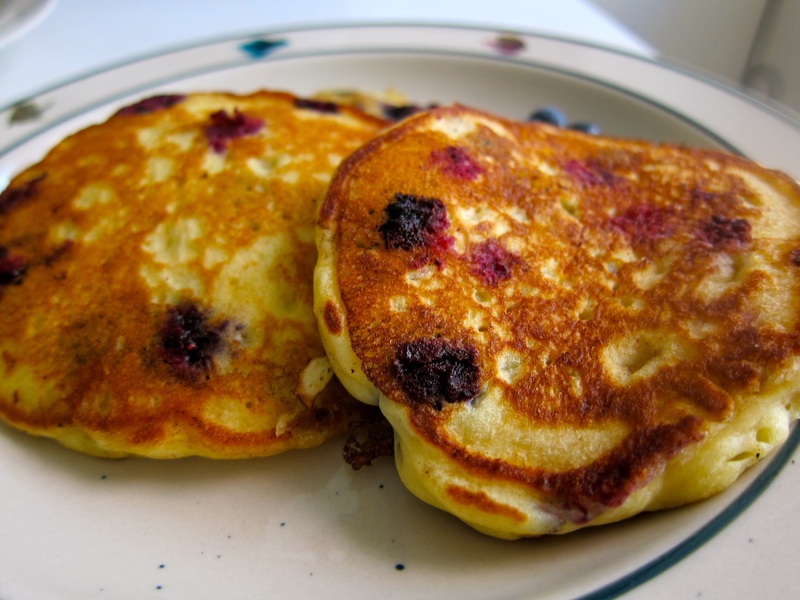 Fresh blueberry pancakes. All of the best breakfast flavors joined forces and jumped inside these ‘jacks. There’s almond extract in the batter. And oats. And buttermilk. And a touch of OJ. Let me tell you a little secret. I didn’t really use buttermilk in these pancakes. I faked it. Stir together 1/2 cup of milk + 1 teaspoon vinegar (I used cider vinegar, but white vinegar or even lemon juice work great, too). Let it sit for 2 minutes or so. Now you have ‘buttermilk.’ Easy in a pinch. Once upon a time, I was afraid of my cast-iron skillet. I wanted one so bad, so then I bought one to be like all the cool kids. BUT, I was never quite sure how to clean it, I never knew if I was using it correctly, I was just confused and scared. Not to worry, we can work through this together. To start, here are 2 great resources for cast-iron skillet cleaning and care: One. Two. I believe the more I cook with my skillet, the better it will get. In other words, more cooking means a more “seasoned” skillet, which, in English, basically means more of me cooking like a mad woman will create a lovely non-stick indoor grilling device. You can grill dogs in the cast-iron skillet. You can make a Dutch Baby come out of the oven. I highly recommend you make a Cherry Clafoutis before cherry season is over. Cast-iron skillet quesadillas? Yes, please. If it weren’t for my cast-iron skillet, I would have never produced such a perfectly golden seared pancake this morning. Truth. Pancake Massacre. Warm blueberries exploding in your mouth with every bite you take. Sweet n’ juicy breakfast heaven. Serve with more blueberries and perfectly ripe peaches. A winning combo. 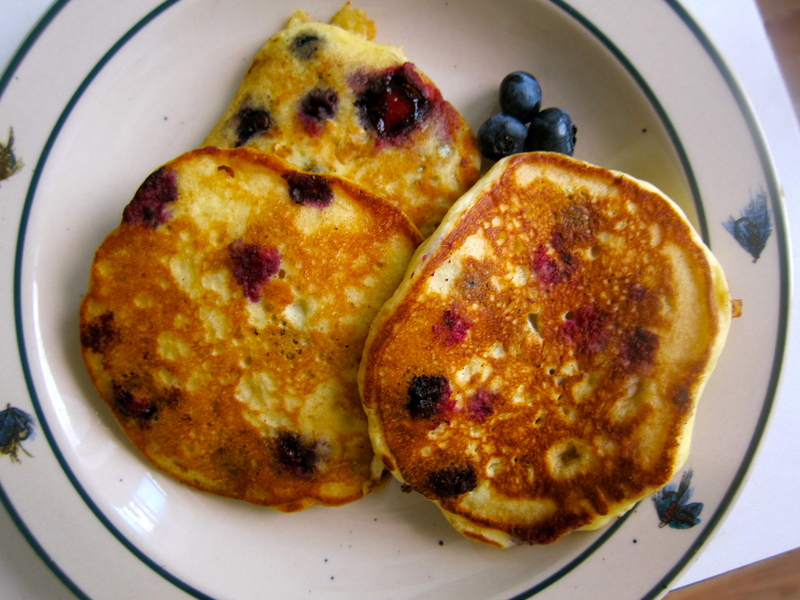 NOTE: If you are making a larger batch of this recipe and want to keep your pancakes warm, heat the oven to 200 degrees F and place finished pancakes onto an ovenproof plate or tray while you cook the remaining batter. 1. In a medium bowl, whisk together the flour, sugar, baking powder, baking soda, and salt. 2. In a small bowl, whisk together the egg, buttermilk, orange juice, and almond extract. 3. Pour the wet mixture into the dry, and whisk until just combined. Fold in the blueberries. Let the mix sit for 5 minutes while you heat your griddle or cast-iron skillet. 4. Heat the cast-iron skillet for about 5 minutes over medium heat to get it warmed up (I made some coffee while waiting for the skillet to heat). Drop in a small amount of butter, enough to coat the skillet. I used a 1/4 cup measure to portion my pancakes. Drop the batter into the hot buttered skillet (I dropped 2 pancakes at a time). Let them cook for 2 minutes, flip, then cook about 2 minutes more. Re-butter the skillet as needed and cook the remaining pancakes the same way (they will start to cook quicker now that the skillet has been on for a while, just keep an eye out). 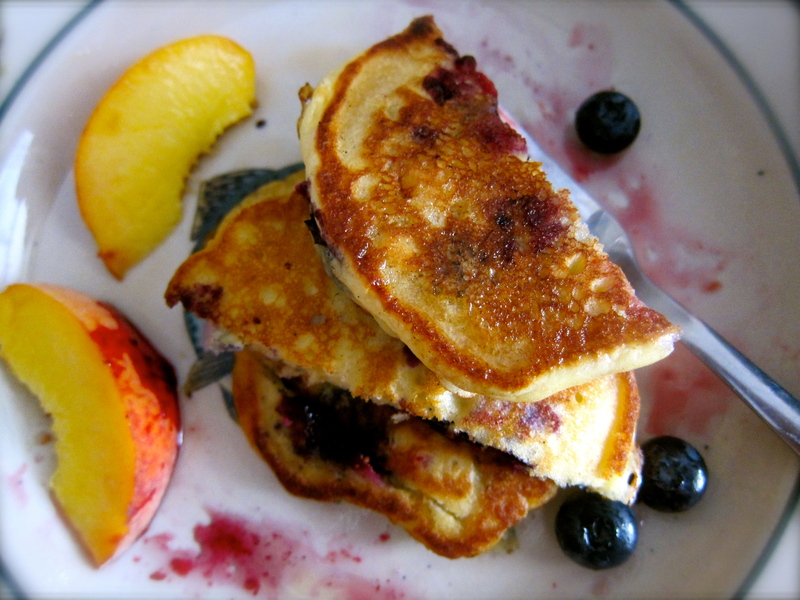 I served my pancakes with more blueberries, fresh peach slices, a hearty helping of good-quality pure maple syrup, and strong black coffee. Beautiful, yummy photographs! Have you changed the camera you use?